PAKOKKU TOWNSHIP, Magwe Division — Myo Myint fondly remembers when his one-acre farm regularly produced 100 baskets of rice. But as rainfall became erratic in this arid region, he started growing betel leaves, a less thirsty cash crop. This summer, the 50-year-old is considering leaving fallow his land in Burma’s central “Dry Zone” because when the stream behind his house dries up in March, the cost of irrigation outstrips the income from any crop. A 2016 drought followed by heavy rains already battered his farm. “Water is becoming more scarce every year. I want to keep growing the crops but there’s not much I can do without water,” he said, sitting beneath the ground floor of his stilt house. His village of Myay Ni Twin, in Pakokku Township, is around a two-hour drive from Bagan, Burma’s top tourist destination known for its ancient Buddhist temples. “When I was growing up, the stream didn’t go dry. Now there’s less rain, and it’s very hard to plant things,” he said. Burma recently emerged from decades of military dictatorship only to face a bigger existential threat. The Southeast Asian nation of 50 million people is the world’s second most vulnerable country to climate change, according to the Global Climate Risk Index from research group Germanwatch. Studies have shown the onset of the monsoon is becoming more variable, increasing the risk of drought. The Dry Zone, an area comprising 58 townships in Mandalay, Magwe and Sagaing, is home to around 10 million people, who mostly rely on rain-fed agriculture. It suffers from year-round water shortages. A recent assessment by Myanmar Climate Change Alliance (MCCA), an initiative funded by the European Union and United Nations, predicted a temperature increase of up to 3 degrees Celsius and a shorter monsoon in Pakokku by 2050. Farmers like Myo Myint—already struggling to make ends meet—will bear the brunt of those changes. His village has a well, but pumping water costs too much, he said. So he was intrigued by the prototypes of soil moisture sensors in the hands of Tayzar Lin, a product designer with Proximity Designs, a Burma-based social enterprise that develops affordable products for farmers. “I’ve been curious since I saw something similar on Facebook,” said the farmer, as Tayzar Lin plunged into the soil a boxy contraption with a dial at the top and an alloy-tipped brass rod at the bottom. The hand on the dial moved to green, showing the soil still held water. Red means dry, and blue means too much water. Myo Myint dreams of watering only when needed, instead of every two days as he now does, to save the precious resource. Agriculture—including livestock, fisheries and forestry—contributes nearly 40 percent of Burma’s GDP and employs around half its workforce, according to Andrew Kirkwood, director of the Livelihoods and Food Security Trust Fund (LIFT), a poverty reduction fund supported by 12 governments. “Agriculture is extremely important to Burma’s economy and future growth,” he said. A 2013 study funded by LIFT identified the Dry Zone as Burma’s most water-stressed region and one of its most food-insecure areas. Inexpensive water sensors made abroad are already available, but their instructions are in English and they are not widely used, nor calibrated by soil type. Proximity Designs’ sensor works with loam and clay, and its staff will train farmers to use it properly, the firm said. The device—expected to retail at an affordable price of around 30,000 kyats (US$22)—is now being tested in three Dry Zone townships, said Proximity’s user research manager Louisa-Jane Richards. A study of growers of flowers, vegetables and betel—a mild stimulant that is chewed—found they were over-irrigating by around 30 percent, she said. Cutting that to 15 percent could save a farmer with 0.5 acres (0.2 hectares) around 170 gallons of water a season. Families in the Dry Zone are also getting help to grow nutritious food in gardens using drip irrigation and hydroponics. 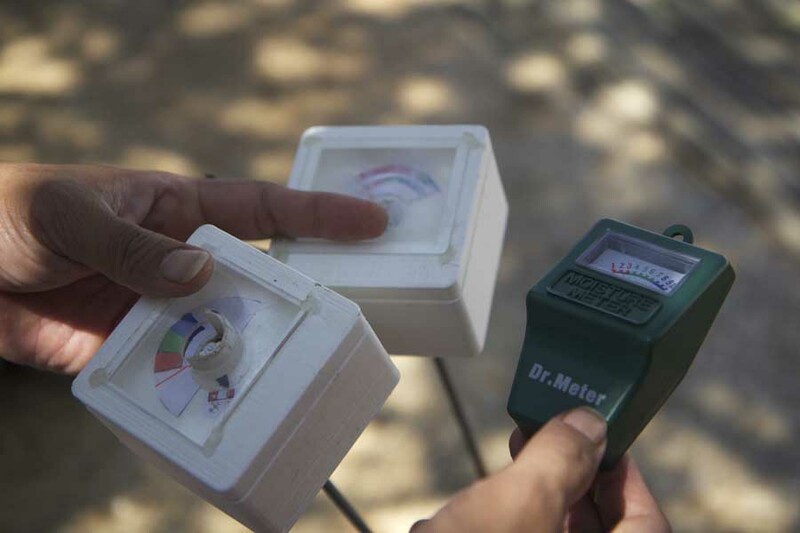 Non-profit Terre des Hommes (TdH) Italy has set these up in 45 villages with funding from LIFT. Shwe Bon Thar, a dusty village in Myingyan Township, shares a pond with five other villages. But when its water disappears in the dry season, locals must rely on acidic well water and fresh vegetables become pricey. 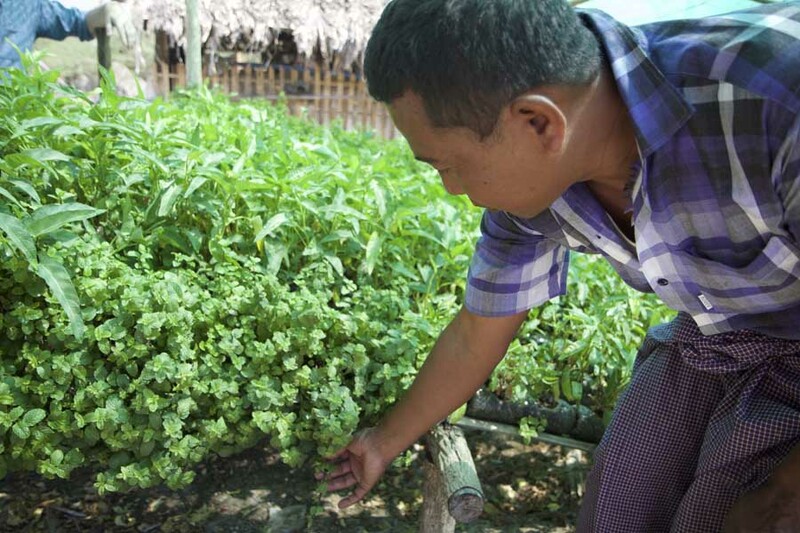 Maung Maung, 46, now makes 1,000 kyats a day selling mint from the hydroponic garden behind his house, a 3-metre by 2-metre plot of vivid green surrounded by sandy soil. 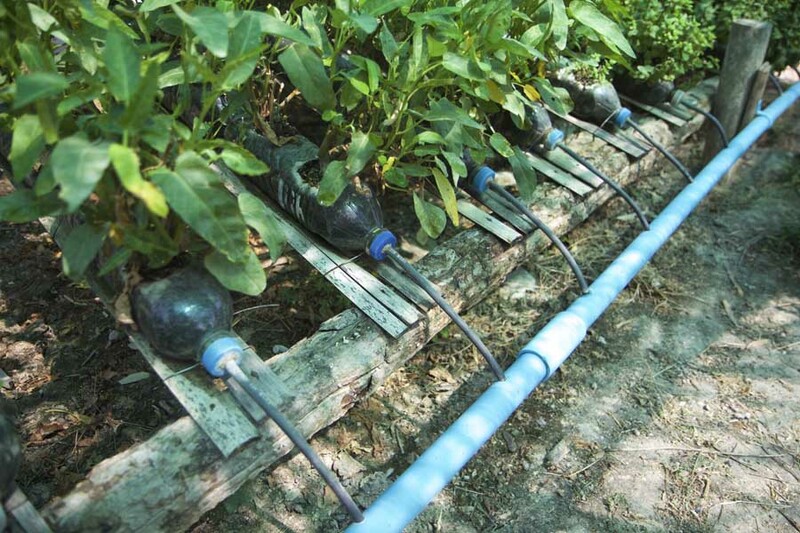 The gravity-fed system irrigates leafy vegetables in discarded water bottles while leftover water collected at the bottom is recycled. Maung Maung, who uses about 5 gallons of water a day, also grows mustard leaves, morning glory and lettuce, which go into the family meal. “We used to eat vegetables only when we could afford it, about three times a week. Now we eat fresh, pesticide-free vegetables every day,” he said. The extra income from selling his surplus produce will help in the coming dry months. Like many villagers, his main crop is pigeon pea, whose price has plummeted this year. Beyond immediate food and water needs, the Dry Zone is also experiencing dramatic shifts. In many villages, most farmers are in their 40s and 50s, as young people have left. Maung Maung’s three adult children work at factories in Mandalay, Burma’s second-biggest city. Pasquale Capizzi, MCCA’s chief technical advisor, said Burma needed to tackle both immediate natural disasters and the more gradual impacts of climate change. “Response… must involve society as a whole”, encompassing local and national government, businesses, communities and civil society, he said. “You must adapt with different crops, different agricultural techniques, different mechanization and productivity improvement—but in some areas you may have to be prepared to learn another trade,” he said. Climate change will intensify risks such as cyclones, floods, and droughts, he added, but will also have “silent effects” on soil salinity, health, and yields. People’s efforts to adapt, said Capizzi, must be supported to reinforce “the innate resilience of communities not to accept fate, but to bounce back and improve”.